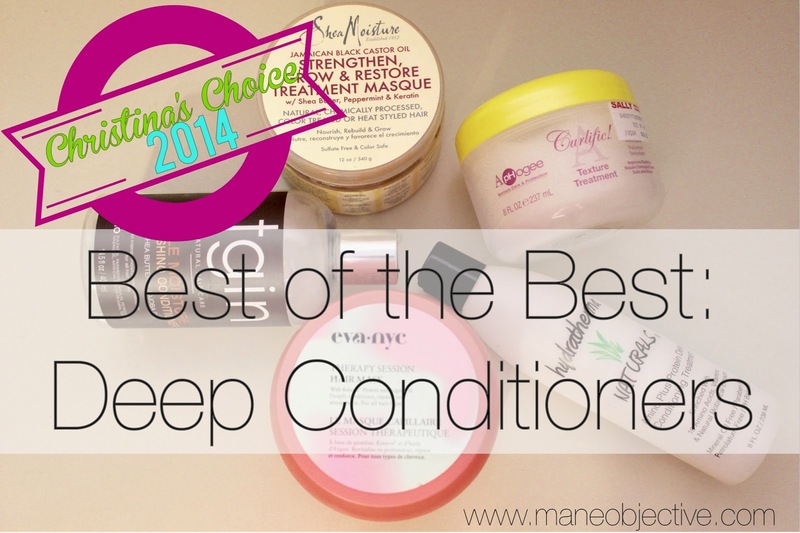 Continuing my end of the year round up, we come to the deep conditioners that have held it DOWN for me in 2014. 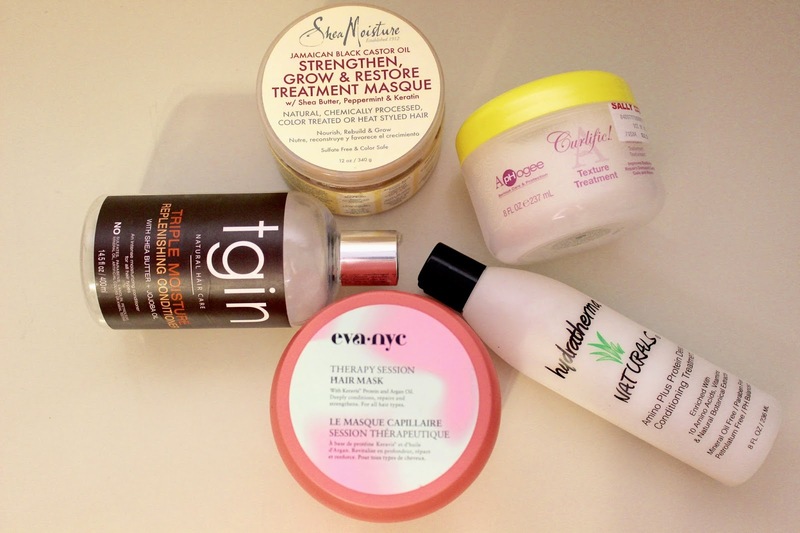 This is probably the hardest list of the lineup to compile -- because I've tried SO many deep conditioners this year, and liked a good number of them. In the deep conditioner department, I doled out a lot of 4's and 5's -- and even recommended many of them to some of you all. But there's a tremendous difference between like, love, and holy-grail-I-never-want-to-run-out-of-ever-in-life aka if-you-ever-stop-making-this-I-will-flood-your-customer-service-inbox-into-oblivion. These products didn't make the holy grail list, but I'd be remissed if I didn't mention them. Maybe they'll take center stage in 2015! For the longest time, I had zero interest in this product. It sat in the back of my deep conditioner drawer for months, and I could kick myself for not digging it out sooner. I honestly can't even craft a good excuse for why it took me so long to give it a try. I'm glad that I finally did, and I am on the verge of declaring my love for Mystic Divine Nourishing Masque. If for no other reason, the buttery smoothness I feel upon rinsing is virtually enough to win me over. I've purchased a second jar, just to see if it's real. Look for a review reaaaaaally soon. Another deep conditioner that flew under my radar is Giovanni's Nutrafix Hair Reconstructor. I like it...a lot. It delivers all that buttery goodness without silicones and other non-CG friendly ingredients, but I'm still trying to wrap my mind around how it works. It's supposed to be a reconstructor and fill in damaged cuticles with proteins, but...I don't see any proteins on the list. Maybe this is an answered prayer for protein-sensitive ladies? After I spend more time with Nutrafix, (I'm on my 2nd or 3rd tube), I'll have a review for you guys! If you followed my Max Hydration Method experiment, then you know Eden BodyWorks Jojoba Monoi Deep Conditioner was my ride-or-die deep conditioner. I used it for virtually every wash day, and it held me dowwwwwwn. After I was done with the MHM, I liked the Jojoba Monoi Deep Conditioner well enough to keep it in rotation for a while, but I fell off in the repurchase area about a month and a half ago. The truth is, it's a wonderful deep conditioner -- I just struggle to make room for it in an already robust deep conditioner lineup. It's great, and I know that if some sort of freak accident occurred and I couldn't get my hands on my top 5, Eden BodyWorks would undoubtedly be my 6th man. Another late-comer to the game, I got acquainted with Ouidad's repair mask for dry, damaged hair in late November. I love how it's thick like butter, and soaks right into the hair (in spite of how thick it is). I am really digging everything about the Melt-Down Mask except the price. At $40 for a 6oz jar, it is one of the most expensive products I have put in my hair. Look for a review very, very soon! I can't believe I actually made it through this list! Up next: leave-ins! Stay tuned! 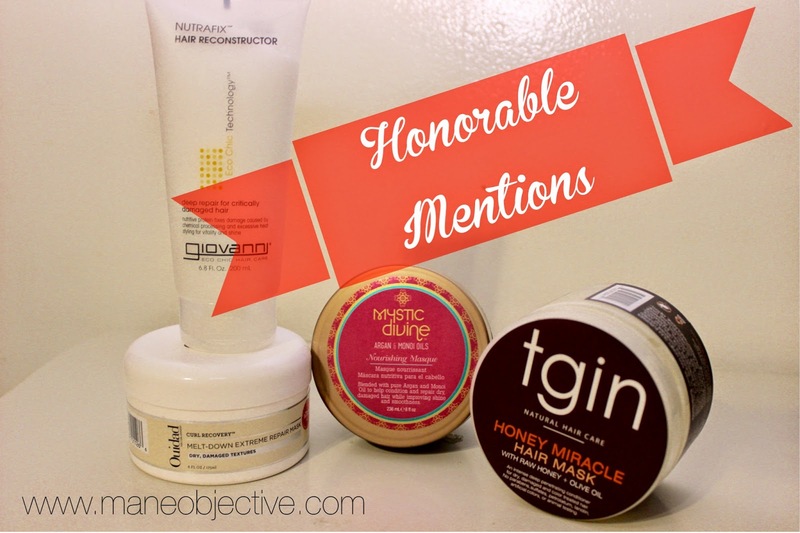 What about Shea Moisture Manuka Honey & Mafura Oil Intensive Hydration Hair Masque? You seemed to prefer it to the JBCO Treatment Masque. What changed? Wooh I know this takes a lot of work, but THANK YOU!!! I'm sitting here making my shopping list just waiting on the next lists to come out so I can add to it lol. Great article! As long as I have been natural I have yet to try any but the shea moisture deep conditioner I need to step my game up. I liked the effect of the Aphogee conditioner. My only gripe was that it was too perfumey for my liking and lingered in my hair all day. *gag* I'm currently using the Eden Bodyworks deep conditioner and intend to use it up before I purchase something else. I like that after effect as well, but the smell reminds me of a toilet bowl cleaner I used to use. Love this post! #BLMGIRL You've given me other products to look into! I haven't tried any of the ones you listed above, but I see a few I am considering trying for sure. Have you ever tried out the Mane Choice Deep Treatment? It works great as well. Someone asked the same question! I still like the Manuka & Mafura, but I had to take a few things into consideration. One, which one did I find myself continually buying more of? Turned out, I kept buying JBCO more (in spite of the smell). Plus, I didn't want to grow super attached to the M&M line since it is a limited collection specific to Target. Now if it becomes a mainstay, then I may change my mind. But don't worry, it's still an amazing product!!! Thanks #BLMGirl!!! I haven't tried The Mane Choice, but I most certainly will put it on my list for 2015!!! Thanks #BLMGirl!!! You are SOOOOO on point with that toilet bowl cleaner smell!!! Lol! I have been trying to peg down an accurate description forever and that is the ONE!!! Lol. ApHogee is on the perfumey side, but it's weird -- I kinda like it. THanks for the love!!! Thanks #BLMGirl!!! TGIN is the truth, one of my favorite all-around brands! I love what that Purification Masque does for my scalp! TGIN though (emoji praise hands) lol. Thanks for stpping by #BLMGIrl! First, fellow #BLMGirl let me say I LOVE your layout! Is it WordPress? I'm hopelessly stuck on Blogger and in need of a better web design. Secondly, one thing I've learned in blogging is how vast our impact can be. God truly does utilize us to reach others through our various platforms. For me, it's less about popularity and getting paid, and more about being a blessing to others. Thanks for your reply. That makes sense. Thanks for putting these lists together! Happy Holidays! I have seen TGIN in Ross / Marshalls if you have it. please do a review on the ouidad curl recovery melt-down extreme repair mask. is it good for low porosity hair is my biggest question. I am too still on the hunt for the perfect deep conditioner. I want to find one that when I rinse it out my hair feels soft and moisturizer. I tried devacurl heaven in hair (fail and hate the scent), I tried As I am hydration (I love as I am leave in but the the deep conditioner ( not enough slip and left my hair feeling like it had buildup when I rinsed it out. I tried most of the Shea Moisture line (all did not work for me) except the JBCO line which I was not going to try because of the previous disappointments but I think I will go buy it now based on your review. Thanks Christina! No problem! Definitely check out TGIN and Eva NYC as well! You got it hon! It's next up on my review list! Have you ever tried Lee Stafford Hair Growth Treatment from Ulta? I've heard good things about it. My tube of Giovanni Nutrifixx lists glycine soja (soybean seed) extract. It's a pretty loose connection to interpret this as the protein! EWG lists it as a conditioner & moisturizer. I have been using Pro Naturals and works really well for my hair ! !